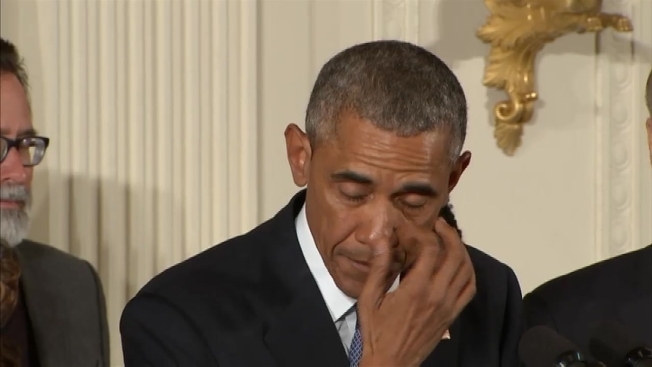 President Barack Obama wiped away tears remembering the first-graders killed at Sandy Hook Elementary School as he announced his executive actions on gun control Tuesday. "Every time I think about those kids, it gets me mad," Obama said of the massacre that left 20 students and six educators dead in December 2012. "And, by the way, it happens on the streets of Chicago every day." The president's emotional moment came as he implored legislators and citizens to unite behind his gun control reforms. "All of us need to demand a Congress brave enough to stand up to gun lobbies' lies. All of us need to stand up and protect our citizens," the president urged. "All of us need to demand governors and legislators and businesses do their part to make our communities safer." Obama's reforms include expanding and upgrading background checks for prospective gun-buyers, hiring more ATF agents and investigators, reporting gun thefts more urgently and providing adequate support for those suffering from mental illnesses. He hearkened back to the Nutmeg State in outlining his executive actions. "We know background checks make a difference. After Connecticut passed a law requiring background checks and gun safety courses, gun deaths decreased by 40 percent." It wasn't the first time Obama fought back tears while discussing Sandy Hook. The president struggled to compose himself during a press conference the day of the massacre. Earlier Tuesday, the father of a first-grader killed in Sandy Hook introduced the president, calling on Americans to "do better." Mark Barden, whose son Daniel was shot at school in Newtown, now helps lead a program called Sandy Hook Promise. The group seeks to prevent gun-related deaths through the enactment of what it calls "sensible gun violence prevention laws, policy and regulations." Several other parents of Sandy Hook children also participate in the group, which is particularly supportive of Obama's focus on getting people more access to mental health care. In the three years since the Sandy Hook shootings, Barden said Tuesday, far too many lives have been lost to gun tragedies. "As a nation, we have to do better," Barden said. "We are better than this."